Playing Peoria is a personal photography project. The purpose is to feature artists, performers and entertainers of all types who are plying their trade in Central Illinois. Each artist is featured in an environmental portrait that shares something about them and something about Central Illinois. Many will also share their story in a short video interview. 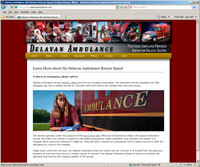 Delavan Ambulance. My wife has served as a volunteer EMT on the Delavan, Illinois ambulance squad for the last several years. Unfortunately, our travel endeavors have put quit a crimp in her availability. The ambulance service is somewhat rare in that it doesn't receive any tax funding at all. It is funded through a very generous grant from a local benefactor, and a modest charge for services. I created the web site during the summer of 2009 to be used as a resource for people interested in joining the team as an EMT or as a driver. 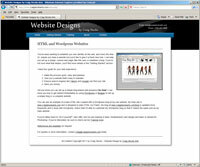 Since I like to do things for myself, I've learned quite a bit about web design and programming. (It helps that I've been a computer nerd for the last 30 years too.) As a result, Since I've been helping a number of folks get their web sites up an running, I've decided to start offering web site design along with photography services. You can see my Easy Web Site information page here. Jewelry by Maxessories by Wini. 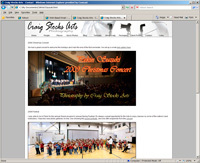 This is my mother's web site. 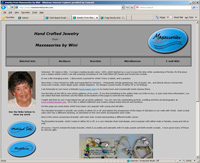 She has been creating custom jewelry for a number of years, and has built up quite a following. 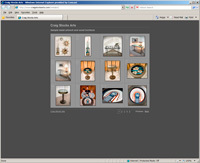 The web site includes several photo galleries showing examples of her work. Wood and metal artwork by Craig Stocks. I've been an amateur woodworker for many years. More recently, I've also taken up metal work. Over the years. I've created quite a collection of hand made furniture and metal artwork that I'd classify as "folk art." Photos from the Pekin Suzuki Violin Program. Our children were active in the Pekin, Illinois Suzuki Violin program when they were in grade school, and now our three grandsons are in the program as well. The youngest is playing cello, the middle grandson is playing violin, and the oldest plays both violin and viola. Sounds like we have a classical string quartet in the making.